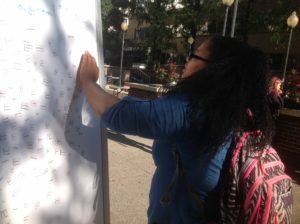 GSU student, Destiny Hives, creates a poem. National Day on Writing (NDW), founded by the National Council of Teachers of English (NCTE) was first held on October 20, 2009 and has since then been celebrated every year on that date. The day was established to celebrate the variety and importance of writing in our lives, from text messages and emails–to scholarly articles and books, and to eliminate stigmas surrounding writing–that it must follow certain rules and is only done in the classroom. In both 2009 and 2010, NDW was officially recognized by U.S. Senate resolutions. A poem by GSU student, Chizoba Mbq. 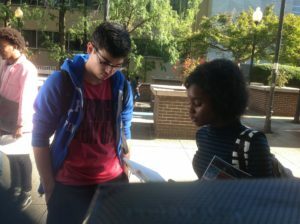 Since 2014, the Writing Studio and the Graduate English Association at Georgia State University have collaborated with other literacy-focused organizations on campus, including University Library, to hold a GSU National Day on Writing. The 2017 celebration was held in Library Plaza on the Atltanta campus on Wednesday, October 18. During the celebration, campus organizations were invited to host creative and fun activities to engage students and the university community in the act of writing. Kasey Abel reads her poem to Fatih Sahinkoyosi. Poems created by GSU students for NDW. 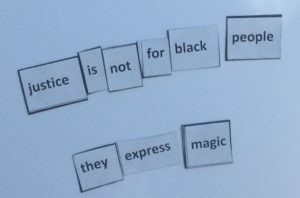 A poem created by a student for NDW. 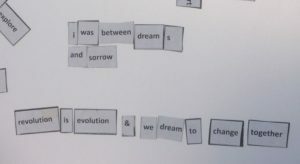 University Library hosted a magnetic poetry station, where students were invited to express themselves creatively. 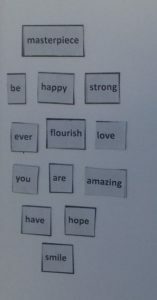 Over 60 students stopped by and created poems, some of which are shown here. Two students even bonded over their love of poetry when one read her poem to the other.